Aside from Hanson Cabs and Trams, a number of ‘better’ Hotels operated their own Charabanc (derives from the French char à bancs – carriage with wooden benches), most usually, to collect and return their clients to the Station. The below example can be seen proudly posed in front of the Bell Hotel (which stood in Horninglow Street close to the current site of T.C.Harrison’s Ford Garage) just after it was registered 1906. 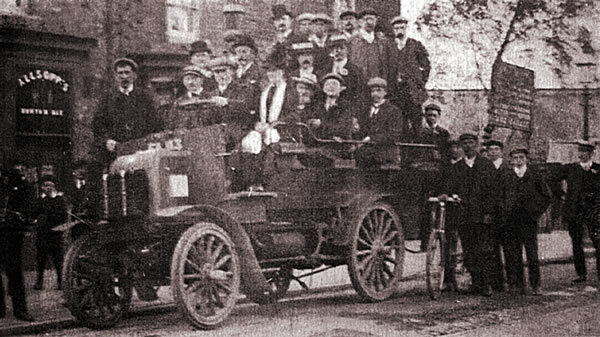 The same vehicle can be seen below in not quite such good times, having been purchased by Allsopp’s Brewery used for Staff Outings and for transporting staff to different parts of the brewery. These continued to develop and were made to order by local motor vehicle manufacturers. 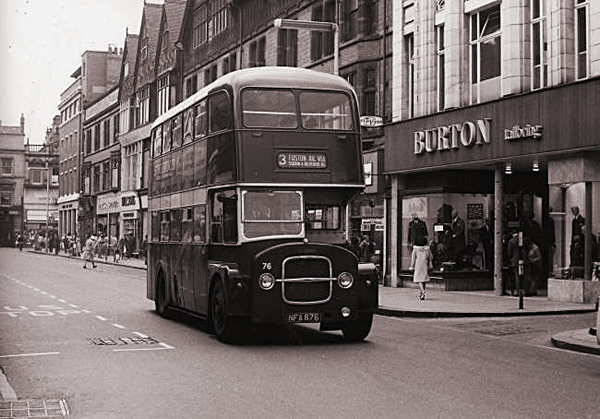 So, what was Burton’s first truly public bus like? This is actually a tricky question. 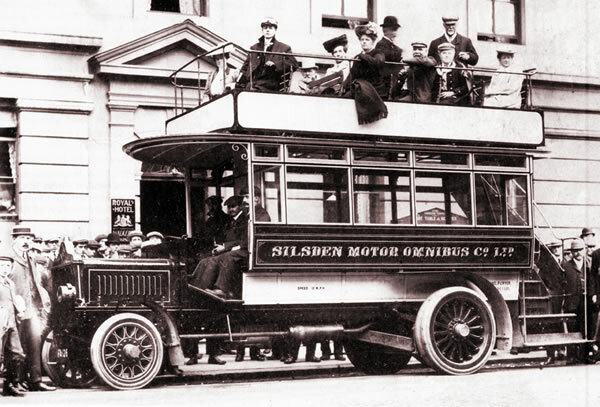 The below Ryknield Bus was the first passenger carrying bus to run in Burton in November 1907; however, it did not belong to Burton Corporation. 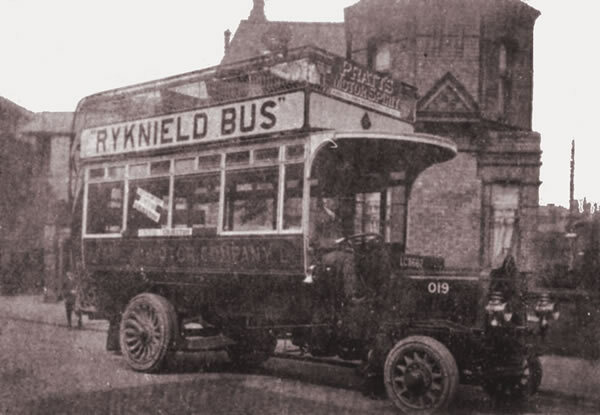 It was built and operated by the Ryknield Motor Company based in Shobnall Street as an experiment to see if transport available to the fare paying general public could prove to be financially successful. The experimental service ran between Uxbridge Street and All Saints Road. Take up of the service was however, much worse than anticipated and not financially viable. 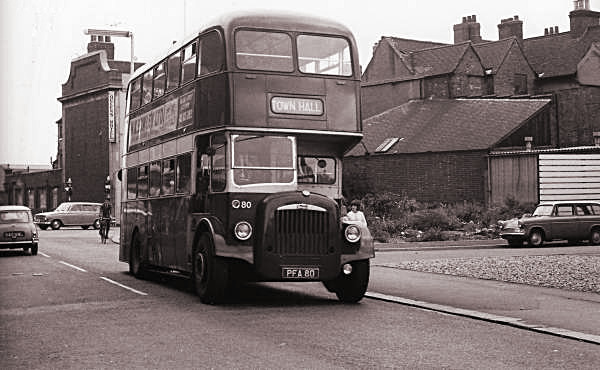 In an attempt to increase passengers, the route was extended from Anglesey Road to Horninglow Street. The fare was a penny for any distance and ran in each direction every twenty minutes. One of the first regular bus services in the country, it still did not however, prove viable but had provided the council with some useful experience. 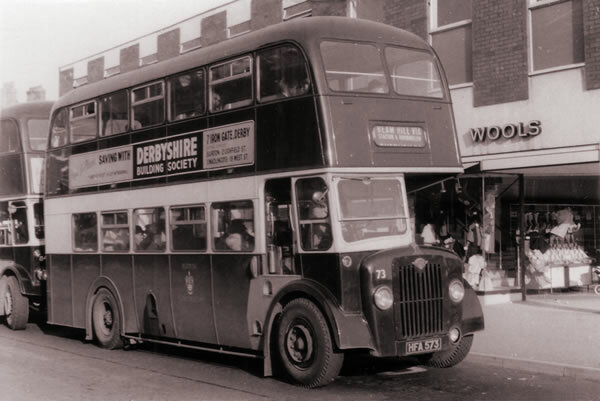 Though the above bus did not operate in Burton, it is a valid picture taken in Derby because it was manufactured by the Ryknield Motor Car Company Ltd (Registration FA 126) in Shobnall Road and provides a much clearer view of the same type of bus. 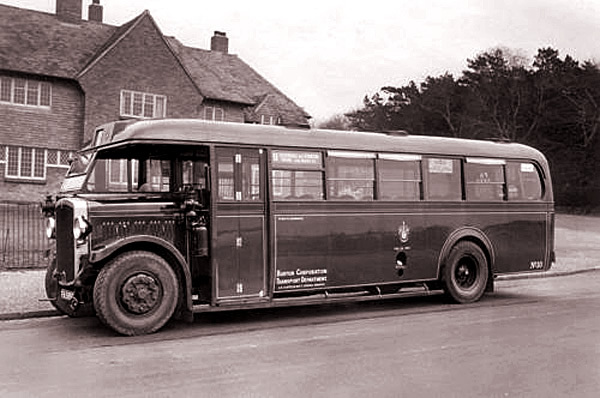 It could seat 36 people, had 32 inch diameter wheels at the front and 40 inch at the rear but could only muster 40 hp which might have made Bearwood Hill a bit ambitious when full. 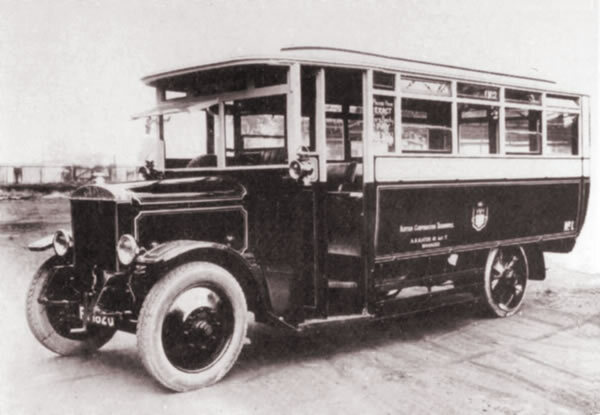 Despite selling numerous buses, including London General Transport and 21 buses to operate in Brussels, Belgium, the company went into liquidation in 1910 but was later reformed as Baguley Cars Limited. 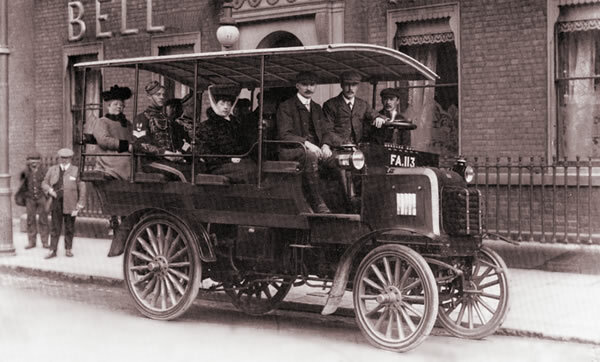 Burton’s next experience of buses, although again, not not strictly speaking a Burton bus, was a regular service introduced in 1914 by Trent Motor Traction between Burton with Derby. The local Borough Council obtained a Provisional Order to work operate motor-buses in 1921, as consideration was given to the replacement of the tramway system, but not used until 8 years later. In the meantime the Council soldiered on with aged trams. In January 1924 one-man operated buses were suggested for use in areas not served by trams and, eventually just two vehicles were ordered from Guy Motors to test public response. These were slightly less ambitious 25 seater single-decker buses (Guy ‘B’ with B20F bodywork for the enthusiasts) which can be seen below. Note that although it had the latest pneumatic tyres on the front, it still had solid wheels at the rear. Two buses were purchased at the cost of £914 each. 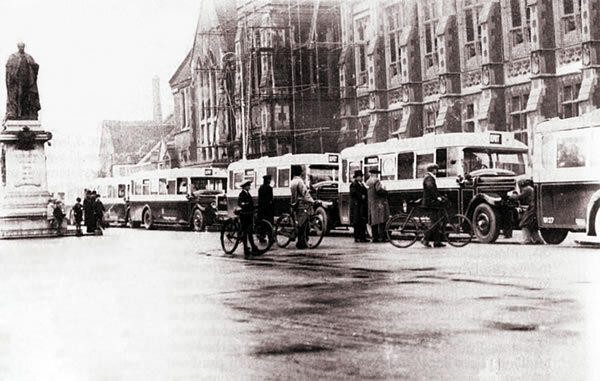 Due to a delay in the delivery of the buses Guy Motors loaned a bus and in May 1924, it commenced work on the experimental service from Wetmore Bridge to the Museum Corner (Station Street and Guild Street junction). The first of the actual delayed vehicles arrived on 31st May, followed shortly afterwards, on 2nd June, by the second vehicle. The two routes selected were from the far end of Uxbridge Street to Museum Corner , and Derby Road to the same point in Guild Street via Horninglow Road. 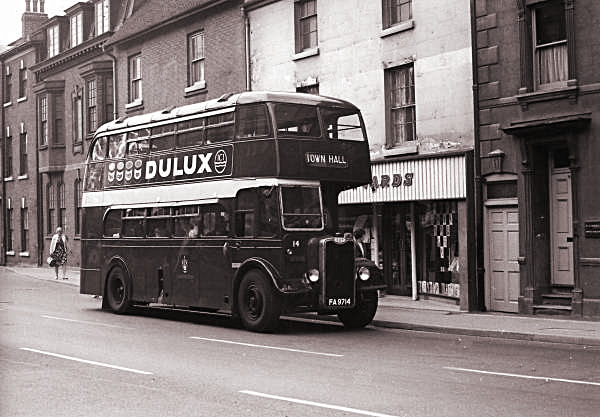 It might be argued therefore, that the Station Street / Guild Street / Union Street crossroads was Burton’s first bus park! A half hourly service was planned running from 8:00am to 10:00pm. The first bus drivers received ‘operating’ instruction from a local driving school and Guy Motors, the manufacturer. The service proved to be successful enough to warrant four more similar buses to be ordered in September. These ran concurrently with the tramway system. In 1928, the Council deliberated between a replacement tramway system and motor-buses. After considering the relative costs and utility of each system, the decision was reached that the tramway should be replaced by motorbuses and a total of 18 buses were ordered, again from Guy Motors, type ‘BB’. Below, the first 10 can be seen in front of the Town Hall for the formal handing over to Burton Corporation in 1929 with Lord Burton’s statue looking on. 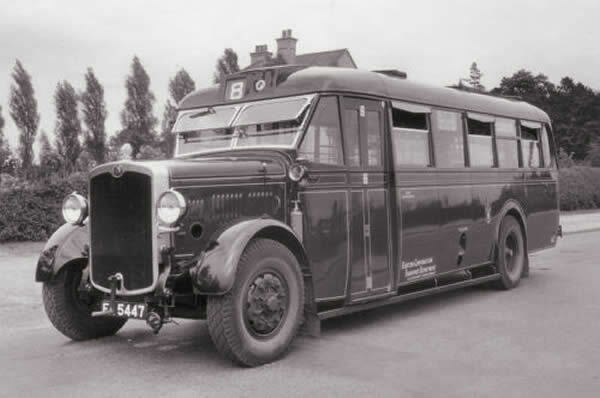 Although Burton’s buses were all originally intended for one-man operation, the PSV Regulations of 1931 required the use of a conductor if certain seating capacity was exceeded. At the time, the Ministry of Transport examiner would not allow vehicles exceeding 20-seats to be one-man operated and so some of Burton’s vehicles were reduced to this capacity. Standing passengers were not allowed on one-man operated buses either, but were allowed if a conductor was on board. 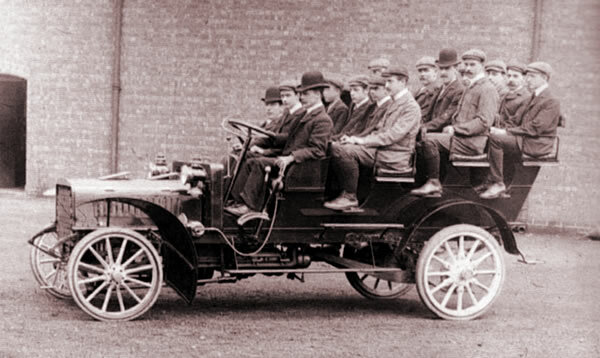 Accordingly Burton increased the seating capacity on other vehicles to 30, which, with the five allowed standing passengers, gave the vehicles a capacity of 35. In order to economise, a system of one conductor to two buses was operated. This entailed the conductor boarding a bus heading for the town centre and, after collecting the fares, he would cross the road to meet a bus travelling in the opposite direction. As a result seven conductors could collect the fares on eight vehicles. Bus inspectors were also introduced to check tickets to make sure that this system was not abused by passengers as well as to make sure that things were running in accordance with the timetable. 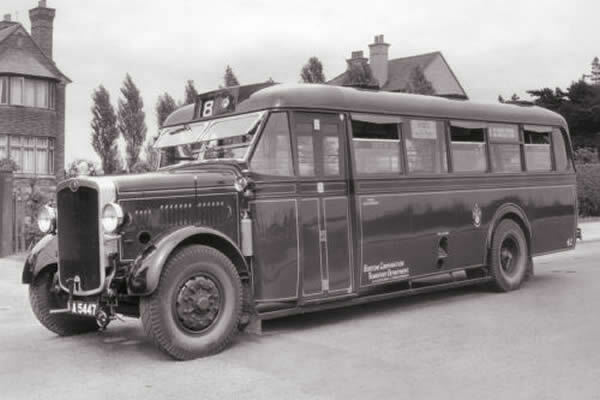 The Council experimented with diesel engined buses in 1934 when demonstrators from AEC, Leyland, Crossley and Guy were tried. This resulted in orders for single AEC and Leyland chassis, along with two Guy Arab chassis. 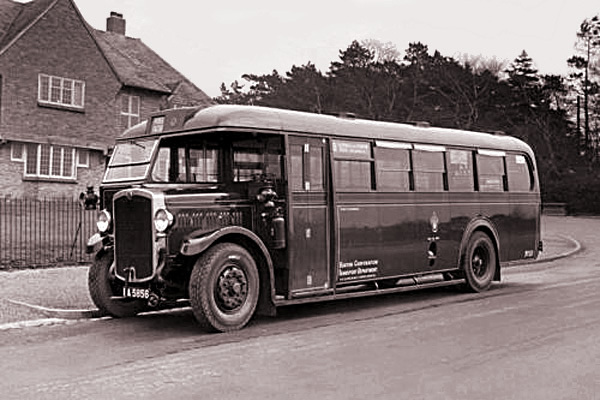 The subsequent performance of the diesel engines showed a marked improvement in economy over the petrol engined buses and, in 1935, 11 of the older vehicles were withdrawn. They were replaced with ten Guy Arabs with Brush B32F bodywork, which entered service the same year. The following year more petrol engined vehicles were replaced and a further 9 Guy Arabs arrived. During the Second World War in 1939, services had to be curtailed. The Ministry of Transport ordering that bus services should be cut by 50%. Some less popular routes were withdrawn and the frequency of others was reduced. 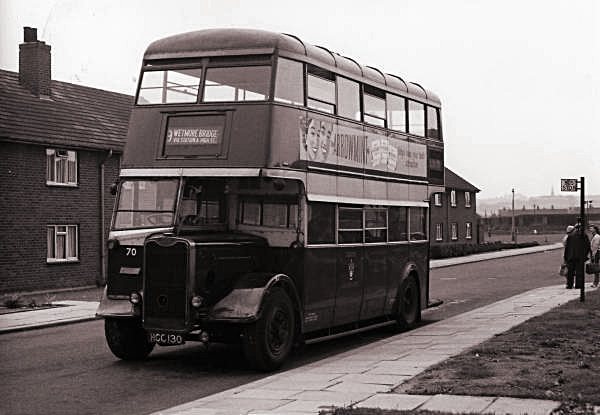 In 1943, Burton received its first double-deck vehicles, two utility Guy Arabs with Weymann H56R bodywork, built to wartime specifications, which included wooden slatted seating. 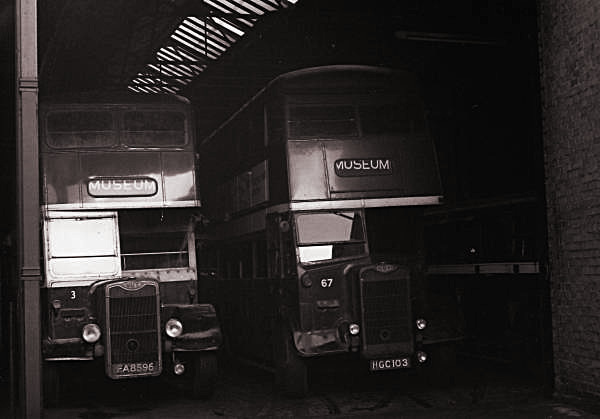 Eight more were delivered in 1944 and the double-deck vehicles proved more popular than the single-deck vehicles, which were becoming heavily overcrowded. A single Daimler CWA6 with Duple H56R bodywork was added to the fleet in 1945, along with three more Guy Arabs. At the end of the war, new council housing developments resulted in numerous new housing estates requiring service. Six more Guy Arabs were delivered in 1947. Nos. 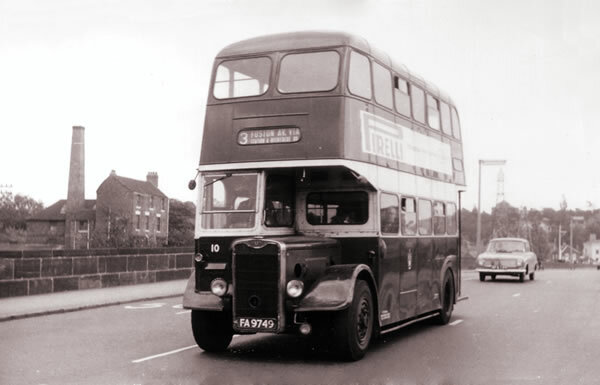 1-7 (FA8595-8600) were bodied by Roberts of Wakefield to a lowbridge design so that these vehicles could pass under the Derby Road railway bridge, which had previously prevented the use of highbridge double-deckers. 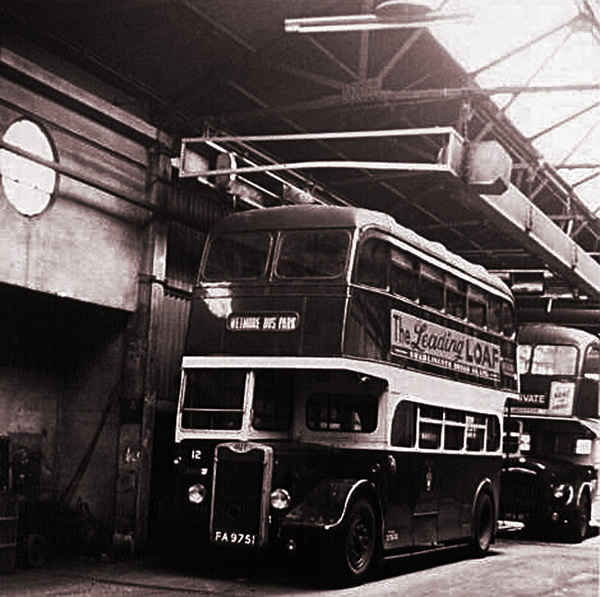 A programme of vehicle refurbishment was carried out in 1950. 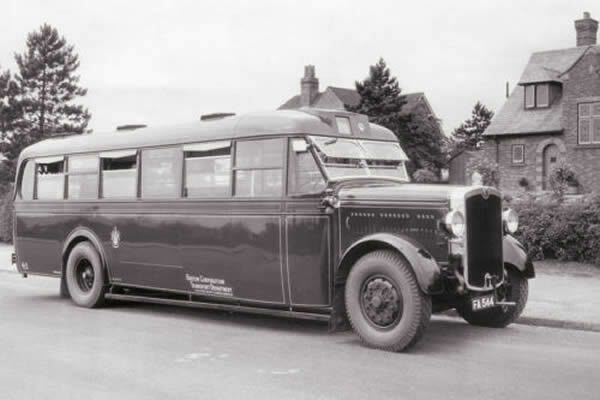 The wartime utility buses had been built using poor quality timber and were prone to premature deterioration. Some were rebuilt by the Corporation themselves whilst others went to Merthyr Tydfil bodybuilder D. J. Davies, who had bodied a batch of Guy Arabs delivered earlier in the year. However, these bodies themselves were found to have deteriorated after just ten years service and three (Nos. 15, 16 and 18) were re-bodied, this time by Massey, in 1960. 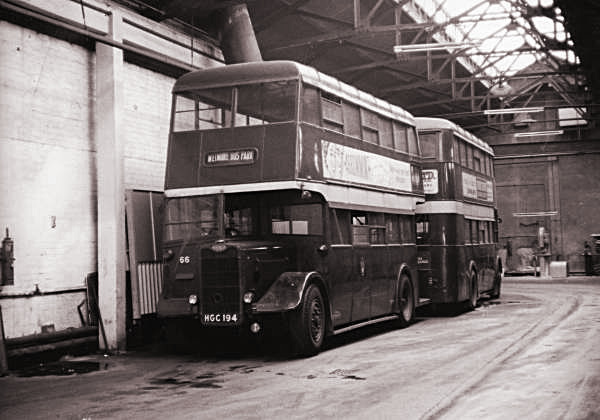 The refurbishment of buses continued steadily throughout the 1950′s until, in 1957, two Guy Arab IV chassis with Metro-Cammell lightweight ‘Orion’ all-metal bodywork were delivered. Subsequently all Burton Corporation buses were of similar construction. Further new vehicles were ordered for delivery in 1957, this time with Massey bodywork. At the dawn of the 1960′s there were various road schemes in the pipeline, including a by-pass which would take away most of the heavy traffic from the town centre. Burton’s main industry was brewing and at the start of the decade they were undergoing a major reorganisation. Much of the brewery traffic had been by rail and Bass, the major brewer in Burton, had a network of railway lines that criss-crossed the town centre with a number of level crossings that added to congestion. With the reorganisation came a change in transport policy from rail to road and by 1965 the railway had been abandoned. The redundant brewery buildings were re-developed. High Street was widened in 1962 and in 1964 Burton’s new Bargates Shopping Centre opened. 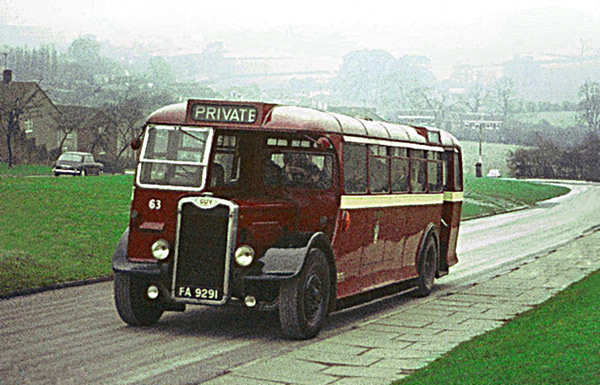 Buses introduced into the fleet during this period had been of Daimler manufacture, replacing the traditional choice of Guy. 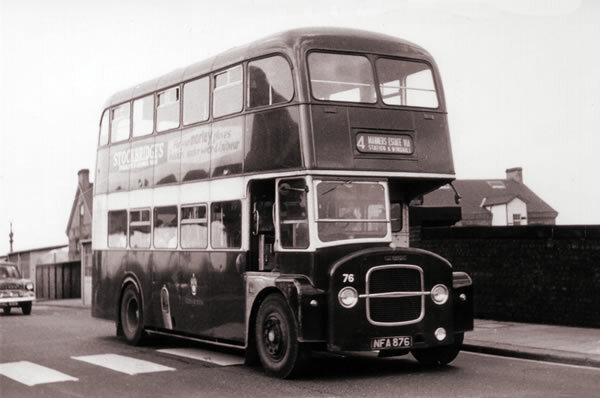 Between 1962 and 1968 24 Daimler double-deckers were purchased, by which time the single-deck vehicle had almost disappeared from the Burton fleet until 3 Daimler SRG’s with Willowbrook B44F bodywork made an appearance in 1969. The 1968 Transport Act introduced grants towards the cost of new vehicles, providing certain requirements were met, one of which was that qualifying vehicles must have an extreme front entrance supervised by the driver. It came as no surprise then when Burton Corporation ordered its first rear-engined front-entrance double-deckers for delivery in 1970. Nos. 106-108 were Daimler CRG6LX ‘Fleetlines’ with Northern Counties H75F bodywork and they were followed by another 12 in 1973. Following local government re-organisation in 1974, Burton-upon-Trent became a part of the new administrative district of East Staffordshire and, although Burton remained the administrative centre, control of the Transport Department passed to the new authority. To commemorate the passing of the Transport Department, Daimler Fleetline No. 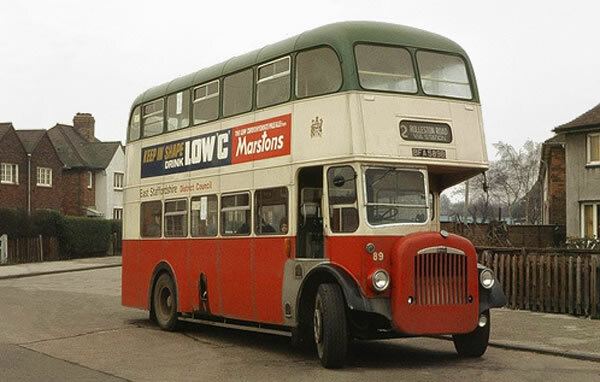 106 was repainted in a special livery and fittingly was the last bus to have been operated in service when, on 31st March 1974, the depot doors closed for the last time on Burton-upon-Trent Corporation Transport Department. A trip down memory lane now for the much wider audience that remember Burton’s streets being roamed by often packed double-decker buses. On the left is Bus No. 3, a 1947 Mark III (bodied by Roberts). Next to it is its younger brother Bus No. 67 which was one of four ex London Transport buses built in 1945. Bus 12, FA 9751 from the same intake as the previous two seen here taking a rest in the Horninglow Street Depot, still showing its destination as Wetmore Bus Park which will doubtless get wound to the correct one by the clippie first thing in the morning as it heads out for another day’s toil. 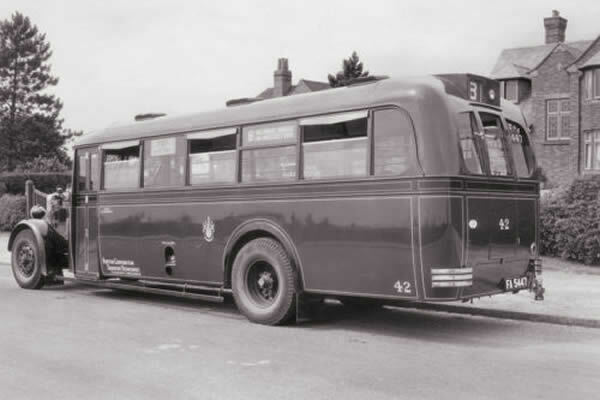 And Bus No.13 of 1950 (Davies Highbridge version bodywork). 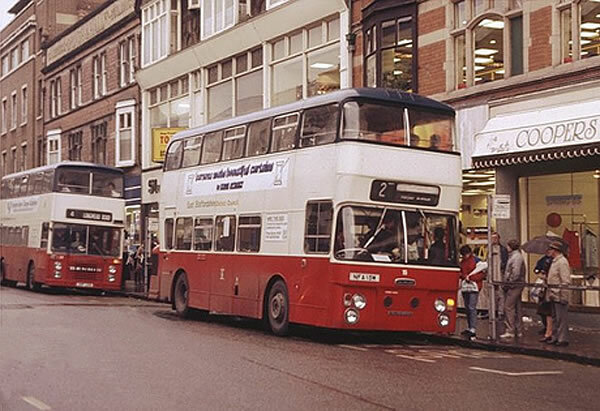 By the time I got to use buses, these were pretty well out of service – except for taking us from school to the swimming baths off the Trent Bridge! I can remember that some older buses had long benches upstairs with a single isle on the right rather than the much more sensible central isle. 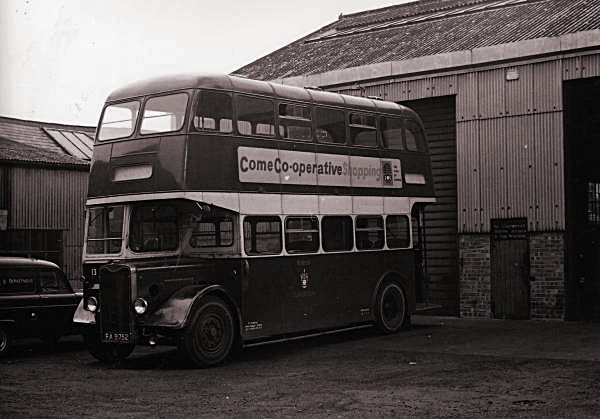 Bus No.14 is also from the ’1950 intake’ but this one has an original ’Davies Lowbridge’ body with a lower upper deck to get under lower bridges. No.18 was an Arab Mk III, still of 1950. Rather than the ’Davies Highbridge’ body, this bus had a slightly more modern looking (!) ’Massey Highbridge’ body. Ah yes, I remember Boots the Chemist being in High Street at the bottom of Station Street… not far from Woolworths. Bus No. 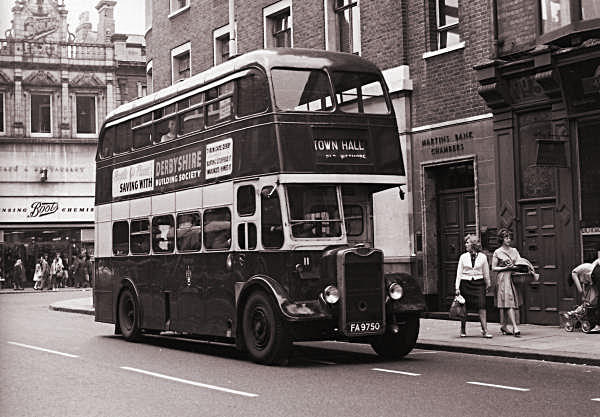 36, is an older 1944 Mark II Arab bodied by Park Royal bus but seen here still going strong in 1964! Bus No. 63, a much rarer Guy single-decker which would at the time often inadequate for the number of passengers. Seen here on a very misty Empire Road, Winshill in the early 1960s. Bus No. 66 was bodied by Weymann, another ex-London Transport bus put out to grass in Burton enjoying the space in the Horninglow Street depot. Bus No. 70 waiting at the terminus. No sign of the Driver or Conductor which suggests that they were in a nearby house enjoying a cuppa as was common. 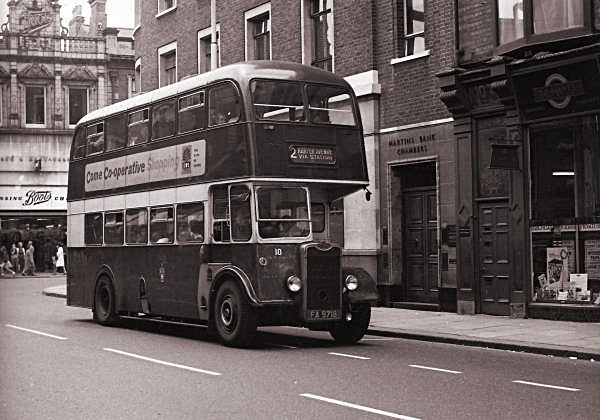 By 1959, buses were starting to look decidedly more modern. Someone will probably jump up and down on me but I think it was a Daimler. By now, it had become common practice to wait ages for a bus only to have two turn up together, as can be seen here outside the wool shop in Bargates. Bus No. 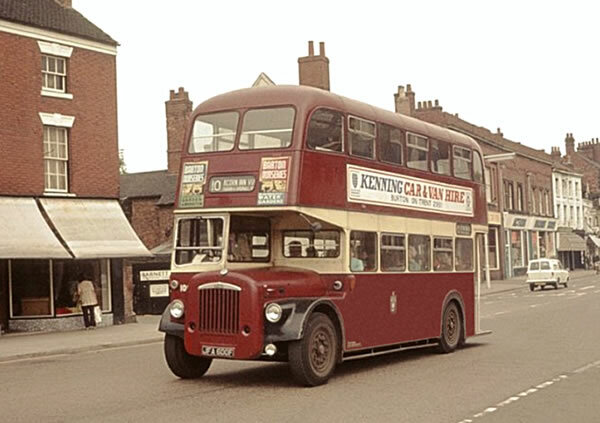 75 from the same 1959 batch, again as evidenced by the consecutive number plates, now with a prefix letter to FA and only three numbers, seen here in Station Street crossing the Guild Street junction on its way to Winshill. The conductress is demonstrating the position taken by passengers who want to jump off at a corner without having to stay on until the bus stop. Bus No. 76 was a later 1961 batch to the above No. 75, as can be seen by the jump in number plate. This time, a Guy Arab IV with Massey bodywork with its distinctive front grill (powered I am told, by a legendary Gardner 5LW engine that had been powering double-decker buses since 1931. 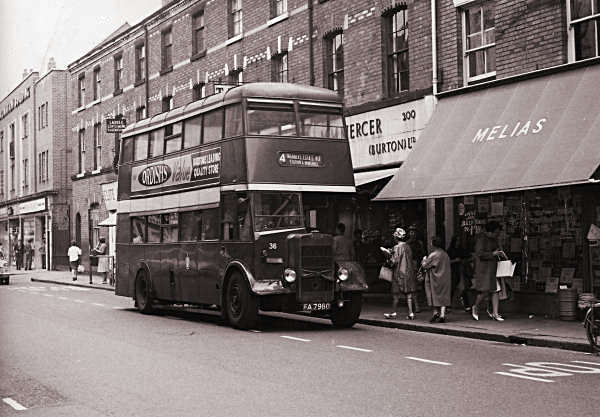 It is passing Burton’s in Station Street which is still in the same place over 50 years later. Although clearly showing that it was a number 4 for Winshill (or a 3 would do just as well), Bus No. 76 was one of the ‘posher’ Guy Arab models that usually seemed to be reserved for more important routes. Bus No. 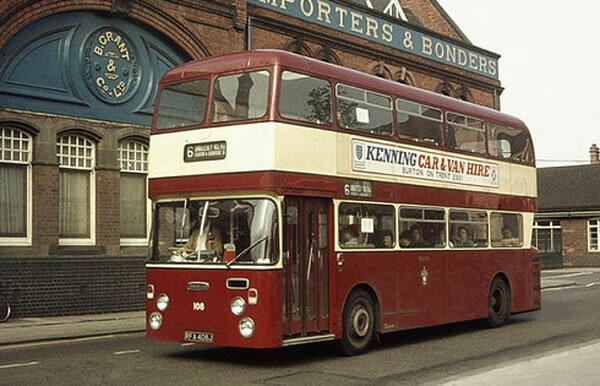 80 dating from 1963, the Burton buses I remember clearest of all. I knew that they were Daimlers but have read whilst preparing this that it was an esteemed CSG5 model with Massey bodywork and 5LW engine - so now you know! It can be seen here heading up High Street with the Queen’s Hotel just behind. Disappointingly for Horninglow residents, it is only going as far as the Town Hall. At some point, the traditional maroon and cream gave way to red, white and green. If I am not mistaken, I also seem to remember that a number of buses were adorned in red, white and blue to commemorate the Queen’s Silver Jubilee in 1977. By the late 1970s, ‘modern’ one-man buses were in service. Though warmer for not having an open platform and stairwell, it was a slight inconvenience not being able to hang off the pole a jump off at the nearest convenient corner, instead having to wait until the bus had come to a comeplete standstill at the bus stop and the doors opened. This picture captures perfectly the original maroon and cream livery with a ‘new’ bus on its way down a still very recognisable section of Station Street. 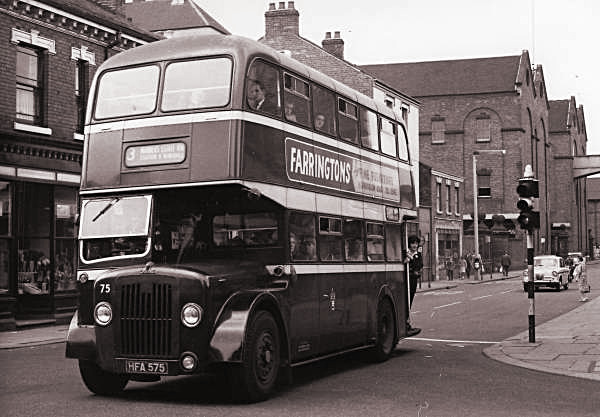 The large Leyland buses pretty much marked the end of an era for regular double-decker services running all over Burton as public transport was finally overtaken by private car ownership. I remember well seeing a number 1 or 2 for Stapenhill and a number 3 or 4 for Winshill together at their respective bus stops ready for their race to the Trent Bridge. 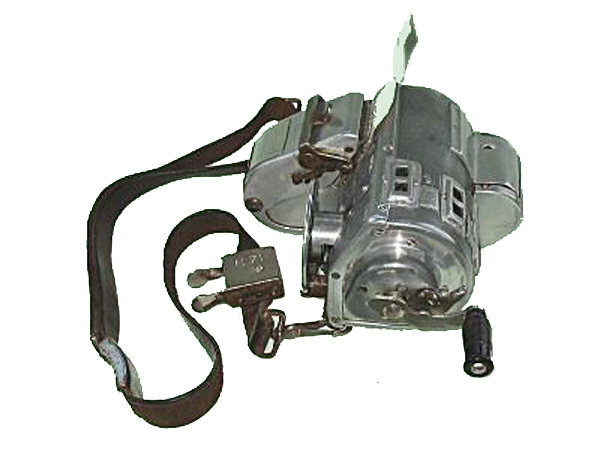 Prior to 1950, bus conductors were equipped with Bell punch ticket machines which was worn around the neck on a leather strap. 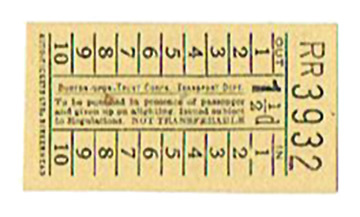 The machine consisted of five compartments which held pre-printed ticket rolls, one for each fares. By selecting the required ticket and pushing a button, a single ticket would be dispensed and a counter incremented. Each pre-printed roll was a different colour to make for easy identification. 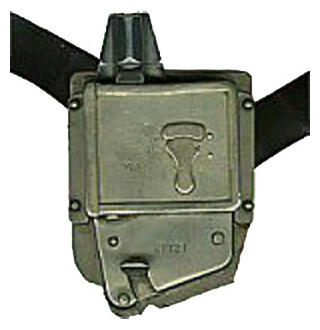 Using a separate punch also worn on a shoulder strap, a hole would be punched in the appropriate Inward or Outward box to show where the passenger had embarked so that a check was provided to ensure that they did not travel past their indicated destination. This example ticket from the early 1940s, unusually, has not been stamped. Burton upon Trent Corp. Transport Dept. 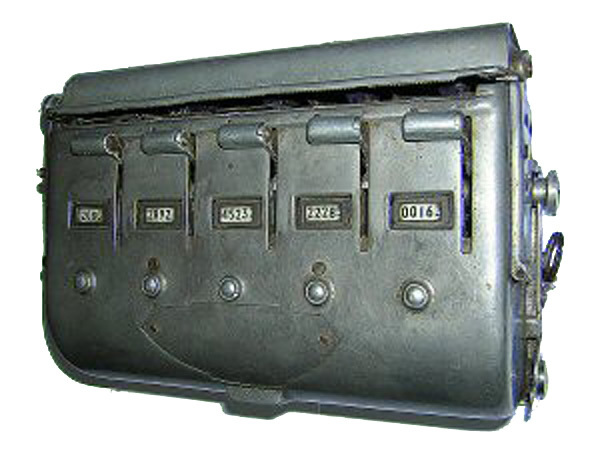 The Bell punch ticket system was replaced by the TIM (Ticket Issue Machines Ltd) system towards the end of 1950. Initially the new ticket machines carried by bus conductors were leased, but they became Corporation property after five years. By dialling a telephone type dial and rotating a handle, a ticket would be produced from a single roll.